All you need to enjoy the stand-up comedy of Eddie Izzard are three things: (1) at least a mild appreciation of British humour; (2) a tolerance of appropriately inappropriate content; and (3) no objections to women's clothing. Popular on both sides of the pond for his clever and irreverent stream-of-consciousness ramblings, Eddie Izzard stands out as a man who breaks the norms of stand-up comedy and just happens to fancy wearing high heels and lipstick. 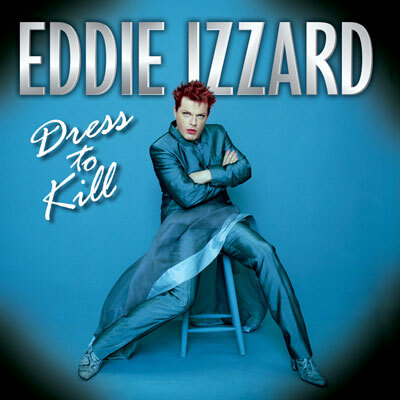 The definitive Eddie Izzard performance on video is undoubtedly Dress to Kill, which is eminently quotable and highly polished. Other recorded performances such as Unrepeatable and Sexie still pack some great laughs, but may occasionally be "too British" for some viewers at certain points. You'll also need enough of an imagination to follow along when pantomime and sound effects replace talking, but these ridiculous segments are usually worth the extra attention. Eddie Izzard typically eschews the standard stand-up discussions of personal anecdotes and private life, instead targeting broader topics and ideas ranging from dogs to vacuums to European history. He's got a bit of a geek streak in him as well, as evidenced by his routines about the original Star Trek and Darth Vader in the Death Star cafeteria (presented here in LEGO format for your amusement). Outside of stand-up comedy, Eddie Izzard has made special appearances on a number of television shows and appeared in or lent his voice to a number of movies, including Mystery Men, Ocean's Twelve and Thirteen, and the decidedly more serious Valkyrie, to name a few. He's also a stage actor and...you know what? This isn't Wikipedia. Here's another clip.